HCM CITY (Biz Hub) — The first metro line in HCM City will become operational in 2020 and will greatly impact the city's property market, a CBRE Viet Nam report released on Wednesday in HCM City revealed. 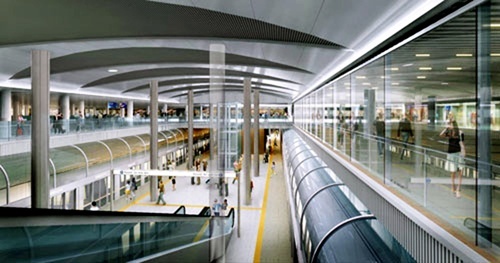 Marc Townsend, Managing Director of CBRE Vietnam, said the report had concluded that the introduction of a metro system will bring about a number of benefits. In particular, it will improve the ability of the population to access employment, retail and recreational activities. The experience among other countries also suggested that one of the most significant impacts of a metro line project was the effect it would have on property values, he said. Rail transit development would bring many noticeable changes to areas around transit stations: land prices would surge, real-estate development would boom and retailers and offices would relocate. "In theory, a home located near a public mass transit system would command a higher rent or sales price than the one that was further away because good public transport allowed those living nearby to travel more easily to and from destinations that are important to them," he said. "This has been well proven through experiences of other countries where the premium for housing prices in locations close to public transport ranged from 6 per cent to 45 per cent." However, he also said, "The impact of a new public transport system on housing prices depended on a number of mediating factors, including housing tenure and type, the extent and reliability of the public system, the strength of the housing market, the nature of the surrounding developments and so on. In a metro area, with a strong housing market and a reliable public transport system that effectively connected residents with jobs and other destinations, the price premium may well be much higher than the average." CBRE believed that in the future, when the metro line became operational, the premium for land prices on sites located within a 10-minute walk from stations could be up to 10 to 20 per cent against sites in other areas. In terms of new launches, CBRE expected that condominium supply in District 2 and District 9 would surge by 58 per cent and 200 per cent in 2017, respectively. Similarly, a 10 per cent increase in retail podium gross floor area (GFA) would be reported in District 2 in the next three years. Regarding land-use impact, Duong Thuy Dung, Head of the Research and Consulting Department, said: "Better connectivity will allow commercial activities to be decentralised away from the congested Commercial Business District (CBD). This will also allow occupancy costs for the city to be controlled and managed by being able to offer alternative locations away from the CBD, but it will still be well connected. It is expected that new clusters of commercial properties will arise along the metro lines, especially for properties in the mid-end levels." With 186,000 riders per day expected for the first line in HCM City, obvious opportunities will be seen in the retail sector where a retail mall is usually incorporated in a community to benefit from commuter traffic. On the other hand, the metro line will also help in expanding the retail catchment area by providing vehicle cost savings to remote shoppers, encouraging them to come to the city centre for shopping.